Hi Don. Thank you very much for taking time out for this interview and congratulations on Angelic Dread (reviewed here). It’s been seven years since Hex. Why so long to release an album? Since the HEX album we released quite a few 7″s and split 7″s. We did not intend to make a new album it just ended up that way. Our plan was to write another few songs for some 7″ projects but when we got finished writing we had an entire album of material. What was it that you wanted to achieve with Angelic Dread? And why did you choose to release the tracks as an album rather than as EPs? We wanted to let people know that we are capable of another album. People almost demanded an album and we like to deliver. All of the songs were written at the same time. They have a cohesiveness to them and to split them up on several releases seemed like a bad idea. Because the tracks were to be for an album instead of an EP or split release, did that affect how you approached the writing? Not really. We were aware of putting too many fast songs on this one. There is a balance that came about organically. The song titles are also balanced. Not all about Satan or Death. There are many dark themes on this record. How long have you been working on the material? Is it all new or has it been accumulating over time? Only about 6-8 months to write the music. The lyrics took a long time for me to come up with different ways to say them same thing. I did want it to catch the listener and hook them in. The release comes with a compilation of new recordings of past material. How did you choose the tracks? And why choose to re-record them? Most of the songs have been staples of the regular NunSlaughter live show. Almost all of the songs we picked were on releases that are long sold out and were released over 10 years ago. It makes it difficult to find these records and we wanted to include everyone in the NS experience so we made them available to all. NunSlaughter have released an incredible amount of splits and EPs. What do you like about these formats? They are a great way to share music with people from all around the world. We are forever bound to these bands. With the split releases, how do you choose who to release them with? I like to do splits with bands that play different styles of music. It is also important that we spread our music to parts of the world that have not heard of NunSlaughter. 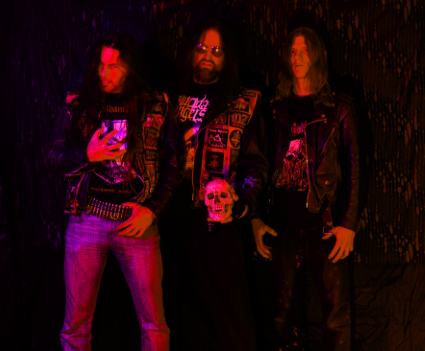 NunSlaughter has been making death metal since 1987. How do you guys keep it fresh and, with so many releases to your name, avoid repeating yourselves? Jim (Sadist, drums) is always aware that we do not repeat ourselves. Titles and lyrics as well. I do like to use the same topics and finding ways to denounce Christ is sometimes difficult but always possible. What are the most significant changes in death metal you’ve seen since 1987? The way it is recorded and the complexity that now encompasses death metal. It’s changed but not entirely for the bad. It also seems to be more acceptable form of music. Are there any bands that have had a significant impact on NunSlaughter that you still listen to today? Most of the big ones like Metallica, Mercyful Fate, Hellhammer, Slayer and Venom come to mind. Either their imagery or lyrics or they way the song is constructed. All of these bands are still in rotation on my record player. What’s your opinion of the death metal today? Are there any bands that have caught your attention? It has become too progressive and the term is now used to describe a wide variety of music that I would never call death metal. As for newer bands. Nothing comes to mind. What do you think of bands that experiment with their sound? Are there limits? There are no limits in the scope of music but when bands use terms like Metal or Death Metal to describe music that does not really fit into that genre it, pisses me off. Death metal is a very influential genre, it’s spawned a number of subgenres, and countless bands are citing old school death metal as inspiration. For you, why is death metal such a potent force? The aggression and the topics that it touches on. Rock and metal were once deemed “dangerous” by the powers that be but now seem to almost acceptable and feature heavily in the mainstream. Has metal lost the potency it once had or is this movement into the mainstream testament to its power? I would say metal has not lost it potency I think it has been given away. But remember we can take it back. The internet has had a colossal impact on music. Anyone can write a track, upload it and achieve fame (at least in some form), and anyone can access music anywhere in the world, either by paying for it or otherwise. What’s your opinion of the internet’s effect on music? I think it is freaking great. Music I did not know about or have access to is now at my fingertips. I don’t make a living from this so I couldn’t care less who is downloading music for free. Is it the modern version of tape-trading? Which do you prefer, CD, vinyl, cassette, or downloads? And why? I dig vinyl for the collectability but CD’s are an easy way to transport music. In the end it does not matter one way or another as long we are listening to music. What are your tour plans for Angelic Dread? Will we be seeing you in the UK? Just our European tour and a few shows in the USA. Currently no plans in 2014 to get back to the UK but we would love to do a few dates for sure. What does the future hold for NunSlaughter? Early days I know as the album is yet to be released, but is there more music in the works? And will we have to wait seven years for another album?